The State of Alaska offers oil and gas exploration licenses through its exploration licensing program. The intent of the oil and gas exploration licensing program (AS 38.05.131-134) is to encourage exploration in areas far from existing infrastructure, with unknown hydrocarbon potential, and where there is a higher investment risk to the operator. Licensees are required to provide any data collected under an exploration license to the state (11 AAC 82.981). 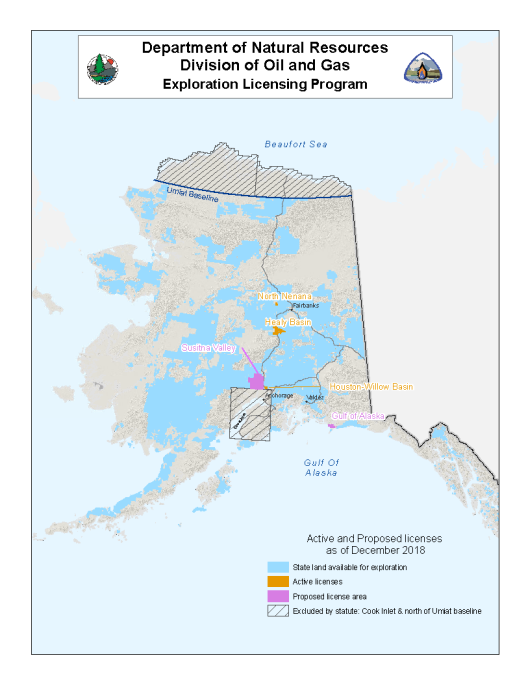 The exploration licensing program does not apply to certain lands (already subject to areawide lease sales) in the North Slope and Cook Inlet regions as specified by AS 38.05.131(b). The Leasing Team of the Division of Oil and Gas administers the exploration licensing program. Exploration licensing supplements the state's oil and gas leasing program and encourages oil and gas exploration outside of the known oil and gas provinces. Several large sedimentary basins exist within Interior Alaska, some of which are virtually unexplored. The highly variable structural geology of these basins offers the potential for structural traps in overthrust belts and strike slip systems. Various types of clastic and carbonate stratigraphic traps may also be present. Exploration licensing allows companies to explore these frontier basins with minimal costs added by the state. An area selected for exploration licensing must be between 10,000 and 500,000 acres. View current exploration license projects and the exploration licensing process by clicking on the links below. Under AS 38.05.131(c), the Department of Natural Resources (DNR) commissioner shall make preliminary written determinations of the state land that may be subject to the provisions of exploration licensing. Preliminary determinations are given public notice using the methods described in AS 38.05.945(b). After completion of the comment period, DO&G evaluates the comments received. After evaluation of the comments received, the commissioner shall issue a final written determination of the state land that is subject to exploration licensing. Exploration license applications may be submitted in areas of the state that have undergone a determination of lands. A determination is not a sale, lease, license, or other disposal of interest in land, nor is it a best interest finding. DO&G is not constrained by a determination, and DO&G is not prevented from making a future finding that a specific exploration license proposal within a determination area is not in the state's best interest. The state has three active exploration licenses and has received applications for two other areas. The Division of Oil and Gas (Division) administers the geothermal exploration and development program for the State of Alaska. Geothermal resource exploration and development is authorized under AS 38.05.181 with regulatory guidance outlined at 11 AAC 84.700-950. The State may dispose of lands with geothermal potential through issuing prospecting permits or leases to explore and develop geothermal resources. Disposal of land for geothermal exploration and development may only occur after lands are designated as proposed geothermal disposal area and a best interest finding is issued authorizing the disposal. Geothermal prospecting permits are valid for two years and may be renewed for one additional year. A geothermal prospecting permittee may convert the permit to a non-competitive geothermal lease. Competitive geothermal leases are issued for a primary term of 10 years and may be renewed for one additional term of five years. Only state-owned, unencumbered lands will be available for lease or permit. For more information on Alaska’s Geothermal Leasing Program, please contact the Division at dog.geothermal@alaska.gov or 907-269-8800.